Birds, turtles, butterflies, bunnies, chicks and ducks, owls, flowers, sheep and lambs, squirrels and a hedgehog applique their way into this fun project. 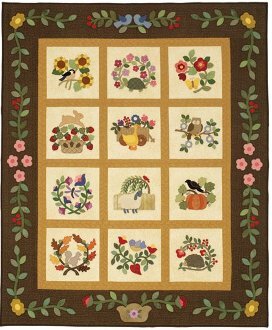 This appliqué sampler is a fun addition to any room as a wall hanging or a sofa throw. Finished size is 60" x 74". It looks great made with wool, cotton prints, or flannel. Pattern package includes an individual glossy full-color booklet for each of the 12 blocks, full-sized drawings of each block as well as the borders, all housed in a glossy cover folder.